Visit the Preston Manor website. A delightful manor house, powerfully evoking the atmosphere of an Edwardian gentry home both 'upstairs' and 'downstairs'. Explore over 20 rooms on four floors, from the superbly renovated servants' quarters in the basement to the attic bedrooms on the top floor. Adjacent to Preston Park, the house also comprises picturesque walled gardens and a pets' cemetery. 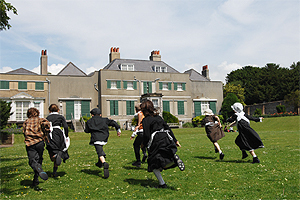 Preston Manor is regarded as the most haunted house in Brighton and featured in LIVINGtv's Most Haunted! in August 2006. For information about ghost tours at Preston Manor, telephone 03000 290902. In common with many other historic houses, Preston Manor closes to the public for the winter season, from October to March. The Manor remains open all year for pre-booked groups, schools visits and special events. Please telephone 03000 290901 for group bookings. Admission fee payable to the house. Entry to gardens free.